There was fighting between fans at the first game in the Honduran capital of Tegucigalpa on June 8, which Honduras won 1–0. The second game, on June 15 in the Salvadoran capital of San Salvador, was won 3–0 by El Salvador; even more violence followed. A play-off match took place in Mexico City on June 26, which El Salvador won 3–2 after extra time. 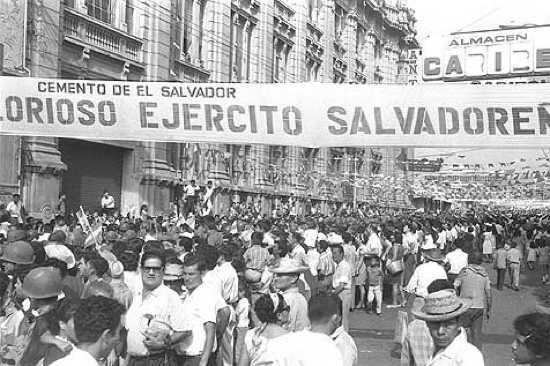 That same day, El Salvador dissolved all diplomatic ties with Honduras, stating that “the government of Honduras has not taken any effective measures to punish these crimes which constitute genocide, nor has it given assurances of indemnification or reparations for the damages caused to Salvadorans.” The Salvadoran Air Force then attacked targets inside Honduras on July 14, which caught the better equipped Honduran air force off guard. The larger Salvadoran army then invaded Honduras. The Organization of American States (OAS) called for a ceasefire; on July 18, after four days of fighting, the “100 hours war” had ended. El Salvador withdrew its troops August 2; however, the brief hostilities resulted in over 2,000 casualties on each side, with some 300,000 Salvadorans displaced, many returning to their home country beaten and brutalized. Jack R. Binns worked at the U.S. Embassy in Honduras at the time. Edward M. Rowell, a political advisor in Honduras at the time, explains the reality of the mob effect on the two nations and their soccer fans. Robert S. Steven, who worked for the Third Party Nationals program, discusses the lack of importance that the U.S. placed on the “Soccer Wars.” They were all interviewed by Charles Stuart Kennedy beginning in July 1990, September 1995, and August 2001 respectively. 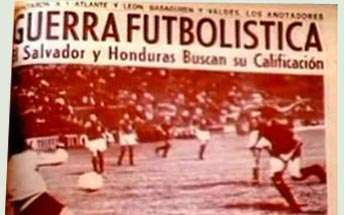 You can also see this brief footage on the war on YouTube: El Salvador – Honduras 1969 Football War. BINNS: Over a period of approximately twenty years, large numbers of Salvadoran had migrated illegally to Honduras, which had a lot of land, almost free for the taking. It had employment opportunities; it had banana plantations which paid much better than any employment in El Salvador. There were probably between 100,000-200,000 illegal Salvadoran in Honduras. The Hondurans viewed the Salvadoran as taking the best jobs because the Salvadoran have a deserved reputation as being extremely hard workers. ROWELL: There had always been frictions between El Salvador and Honduras… El Salvador was over-populated, and its lands were controlled by an oligarchy that dedicated them to the coffee industry. 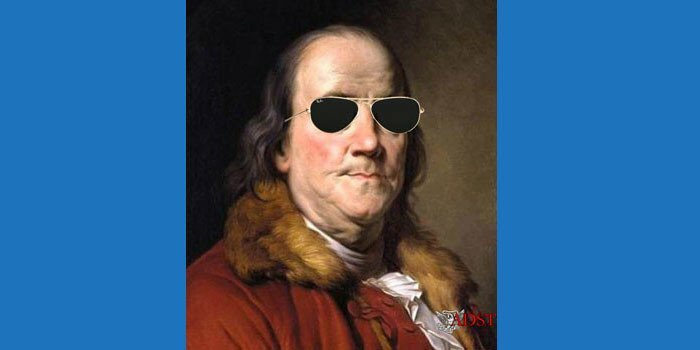 But there were other jealousies and frictions. Forty-eight hours before the war started I sensed that if it was going to happen, it would come that weekend. Don’t ask me how I knew it. It was just something in my bones. I could see the arguments going back and forth in the traffic between our Embassy and the Embassy in San Salvador. BINNS: Tension between Honduras and El Salvador rose after a game in El Salvador which hosted the Hondurans. The Salvadorans stayed up all night screaming in front of the hotel where the Honduras team was staying so that no one could sleep. It was trivial, but shortly after that, riots broke out in Honduras where Salvadoran were dragged out of their homes, beaten, driven off jobs, brutalized. Obviously, the Honduran government sanctioned those mob actions. 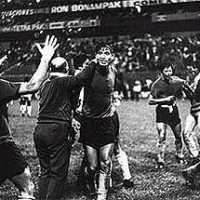 ROWELL: Rumors had circulated that somehow the Salvadoran team had been harassed when they visited Honduras. When the Honduran soccer fans went to El Salvador, people along the side of the highway in El Salvador fired shotguns and rifles through the busses carrying the soccer visitors. Then there was a big riot at the stadium in El Salvador. Somehow, the Hondurans got back home. When word of the violence in El Salvador spread, there was a riot in Honduras. A lot of Salvadorans lived in Honduras, many of them shop owners. Their shops were ransacked, and they were frightened and scared. The next thing we knew, the Salvadoran government had launched a war against Honduras “to protect its citizens in Honduras.” To this day I don’t know what or who really triggered all of that violence. BINNS: Literally thousands of Salvadoran immigrated back to El Salvador, including some who had lived in Honduras for as long as twenty years. Many were in bad physical condition because they had been beaten or because they had to walk fifty or hundred miles to the border. It was a very, very bad situation. Tensions were rising dramatically. Both military groups were making noises about the each other’s barbarity. Finally, in July 1969, the Salvadoran armed forces launched a military attack on Honduras, driving twenty to thirty kilometers into the country. Then they literally ran out of gas and couldn’t move forward. ROWELL: So the Honduran Army was sitting there with machetes and old rifles, facing the Salvadorans, who were coming in with Belgian made automatic weapons. The Salvadorans also had armored vehicles in the form of jeeps with one-quarter inch steel plates welded onto them. So there was an armored assault across the Honduran frontier which was “defended” by troops with machetes and hunting rifles. The Salvadoran Army at the time was not terribly well disciplined. The automatic weapons were a disaster in the hands of undisciplined or untrained soldiers. They exhausted their ammunition in the first 15 minutes of the war. They simply put their weapons on full automatic when they crossed the Honduran border and fired at anything they saw, and there wasn’t much there. The invasion slowed immediately because the Salvadoran soldiers were on their own — with machete against machete. That’s a different sort of conflict. The safety of Americans became a big problem. The Hondurans insisted that the US send in reinforcements to protect them. We refused. We refused to give them ammunition or military supplies to help their side. They were furious at us. We helped to protect some innocent Salvadoran civilians who risked death at the hands of vigilantes. There was a curfew and a blackout. It was a very effective blackout, because they simply turned off the electricity supply to the city. All lights went out. Vigilante groups roamed the streets of Tegucigalpa. If they spotted a candle through a window, they would threaten to chop down the door to put out the candle. They were afraid of more air raids, and said that no light must show. Every night we would have some Americans calling, saying that the vigilantes were threatening to chop down the doors. You have to understand that we had become horribly unpopular. I remember one night when an American woman out at the edge of Tegucigalpa called. She was alone with her children. The vigilantes were literally chopping at the door. I went out to her house. You couldn’t show a light on a vehicle. It was the new moon, and there was no moonlight. Tegucigalpa is a mountainous city. We were driving on mountainous roads in starlight. So what should have been a 10-minute ride took 40 minutes, and I had to pass through four vigilante checkpoints on the way. I reached this woman’s house. The vigilantes were sitting outside the house. I don’t remember what I told them, but they stopped threatening her. We had two or three calls like that every single night. BINNS: Within 100 hours, the OAS had intervened and a truce was established. Ultimately, the Salvadoran withdrew. 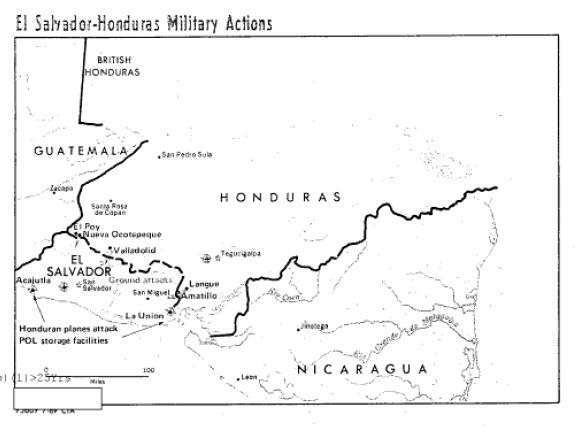 Interestingly enough, in the days preceding the outbreak of the war, we were extremely concerned about the possibility of a Salvadoran incursion into Honduras. There were a lot of reasons why we didn’t want that to happen, but suffice it to say, our efforts to avoid the war were unsuccessful. ROWELL: I had lived in Argentina and understood that simmering border issues can produce war, so I wasn’t completely surprised by the violence. However, it was the kind of thing that I would not have predicted. You can never predict when a mob is going to form and get out of control. You really can’t. Since we have so many events like soccer matches, where people collect in numbers large enough to create a critical mass, you can be caught by surprise. That happened. STEVEN: It was a difficult job trying to get anybody in Washington in the Department to take it at all seriously. Everyone had the same reaction: oh, it’s crazy in Central America, banana republics having a war over a soccer game or something. It was like saying as soon as they assassinated the Archduke in Sarajevo in 1914 that that was just a minor thing. It set it off and was a catalyst for a lot of trouble.